The Crusader was one of two key tanks supporting the Allied attack on the Axis forces that was code-named the same (the other being the American M3 Stuart). It equipped 22 Armoured Brigade (fully) and 7 Armoured Brigade (partially) in 7 Armoured Division in the initial battle, and 1 Armoured Brigade (partially) in 1 Armoured Division during the counteroffensive, when 7 Armoured Division had been withdrawn. The tank was much maligned for its mechanical reliability, and it is clear from contemporary records that it was considered problematic at the time, not just because of a major concern being the hitting power of the 2-pdr gun that was it’s main armament, but also because of its mechanical reliability. On 12 December 1941 it had become clear that the Axis forces were withdrawing westwards, and it was expected that they would fight rear-guard actions while doing so. In consequence, 7 Support Group received a new task, namely to (i) keep touch with the withdrawing enemy; (ii) to harass him as the opportunity offers; and (iii) to act as harassment screen in front of 4 Armoured Brigade, the main armoured force of the 8th Army at this stage in the operation. On 13 December, 7 Support Group HQ therefore issued an order to reorganize, which is contained as appendix 11 to the December 1941 war diary (WO169/1185). This is given in full below. I have tried to preserve the original formatting, as much as the blog software allows this. The document gives a nice overview of the constitution of the so-called ‘Jock’ columns. It also shows quite clearly that they were weak units, not able to carry out sustained fighting, but mobile, and therefore rather good at hit-and-run. The only striking power they had lay in their artillery. The infantry component was too weak to take or hold anything, and would only have served as local protection. As JonS points out below, 3 RHA was an AT Rgt, equipped with 2-pdr AT guns. So contrary to my first impression, the columns were well equipped in anti-tank artillery, with up to 12 guns each, and all or most of them would have been Portees, I guess. W.e.f. 14 Dec Sp Gp will be organized into 3 colns. 11 H, 2 S.G., 203 Bty, 51 Fd Regt RA will join GDS BDE by 1400 hrs 14 Dec.
102 (NH) will join 4 Armd Bde by 1400 hrs 14 Dec. In consequence of the above, following will take place at last light tonight. 2 S.G. will pull out and R.V. 2 miles East of 7 Sp Gp H.Q. HUGO Coln will take over remainder of MAYFIELD Coln – 60 Fd Rgt RA in support – except for tp 3 Bty, 1 L.A.A. Regt RA which will join CURRIE Coln at last light. 203 Bty will R.V. with 2 S.G.
Two tps 102 (NH) now with B Ech will move direct to B Ech 4 ARMD BDE as soon as possible after first light tomorrow. Tp 4 Bty 1 Lt. A.A. Regt. Tp 3 Bty 1 Lt. A.A. Regt. One tp 2 Bty 1 Lt. A.A. Regt. Locations GDS BDR and 4 ARMD BDE notified later. L.A.A. – Light Anti Aircraft, usually 40mm Bofors, sometimes captured Italian 20mm Breda, or 37mm Bofors guns. BenCol (Benghazi Column) was an evolving concept during Operation CRUSADER. The aim was clear – envelop the southern flank of the Axis forces, push a sufficiently large force onto Benghazi, and thereby cut the Axis forces in eastern Cyrenaica off their lifeline, by taking out the only harbour worth mentioning, and cutting the coast road, as well as taking out the Benina and Barce airfields, which were important bases for the Axis air forces. Had the operation been carried out, it would almost certainly have been written about and heralded as a daring example of command. Combining two smallish, highly mobile forces, with their own air support, supplied over a sea controlled by enemy air forces, a dashing paratroop special forces raid thrown in, to reach far into the rear of the enemy. The Germans at least were extremely concerned about it, and strengthened their defenses in western Cyrenaica. Over the course of CRUSADER however, with increasing losses and uncertainty in the key battle around Tobruk, the ambitious plans had to be scaled back, and finally abandoned when the battle had moved beyond it. The distance of advance from Tobruk to Benghazi, using the best possible route, was 350 miles. The information is from WO201/635 – Bencol Advance on Benghazi. In an undated document from November the idea was for a mixed Army/RAF force, led by 7th Armoured Division HQ, to carry out this operation once the battle around Tobruk had advanced to a point where command could be certain that the force (then called ‘Column “F”) could carry out its mission, advancing either via Antelat, or Er Regima in the north, although it was pointed out that no fighter cover could be guaranteed on the northern route. Det. 142 Field Park Sqdrn. 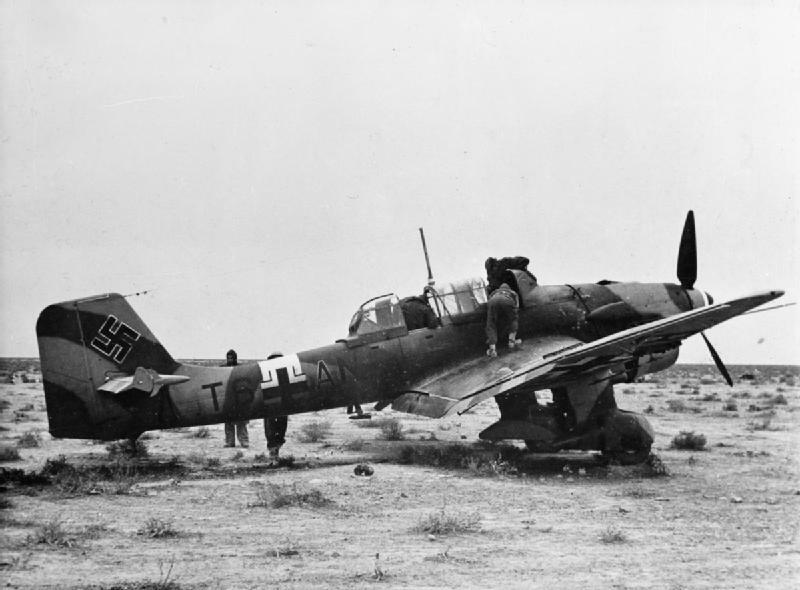 It was supposed to meet with Brigadier Reid’s ‘Force “E”‘ at Antelat, south-west of Benghazi, with Reid’s men advancing from the south towards the coast at Agedabia, taking the airfield there, and cutting the coastal road. Before arriving there, a party of parachutists under Captain Stirling was supposed to jump onto the airfield, destroying all the airplanes there. The RAF element consisted of six fighter squadrons, with one of these permanently based on L.G.125, deep in the desert south-west of Tobruk. The time to get to Benghasi was estimated at 3.5 days. The original vehicle requirement of the column was ca. 2,200 organic vehicles, and another 2,000 for supplies, but this was not seen to be possible, and instead the column was expected to carry five days of supplies, and should then be supplied by (truck?) convoys. The latest documents I can find refering to this are dated 30 November. When the battle around Tobruk made it impossible to send anything from 7 Armoured Division, a scaled-down version of the plan was introduced, and the name “Bencol” introduced. First orders seem to have come out on 1 December. The new order of battle for Bencol simply removed all elements from 7 Armoured Division, i.e. HQ, 4 Armoured Brigade, engineers, and elements of Support Group. Command of the advance would be exercised by Brigadier Marriott, Commander of 22 Guards Brigade. Total: 6,649 men, 2,088 trucks, 88 motor cycles, 132 carriers, 58 armoured cars, with weekly supply requirements of about 1,000 tons. Additionally, RAF strength had increased to 12 Squadrons, and was expected to be 4,500 men and 500 trucks, with supply requirements of 500 tons (this was a guesstimate). To ensure supply once Benghazi had been taken, the Royal Navy was requested to send a ship to Benghazi to land supplies not before 12 December, especially fuel and ammunition, once the port had been taken. This would presumably have been one of the more interesting assignments on offer at the time. By 9 December planning had changed slightly, adding back CRE 2 Armoured Division, 3 Fd. Coy RE, 142 Fd Pk Det., a squadron of M3 Stuart tanks, and reducing infantry to two battalions and the LAA Rgt. to a single battery. The RAF component was to be under the command of Adv. HQ No. 258 Wing and was called ‘Whitforce’. It consisted of No. 2 (SAAF), No.4 (SAAF) (both Curtiss Tomahawks), No.33 (ground attack Hurricanes) and No.250 Squadrons (Curtiss Tomahawks), as well as of light and heavy AA, No. 2 Armoured Car Regiment, and various maintenance and supply units. On 17 December, following a few bloody days on the Gazala line, the operation order was given to Bencol. In the period 9 to 20 December the availability of trucks exercised the mind of planners. In the meantime, on 18 December the Axis forces retreated from the Gazala line, and 13 Corps opened the pursuit, making the original role of Bencol surplus to requirements, and more importantly requiring so many trucks that it was no longer practicable to operate Bencol independently. The truck allotment was consequently reduced again, and Bencol was ordered to move straight west, towards Msus, and thence drawing on 13 Corps supplies. The 7th Queen’s Own Hussars were one of the cruiser-equipped armour regiments in 7th Armoured Brigade of 7th Armoured Division, the famous “Desert Rats”. The regiment did not have a happy operation, and by 27th November was moved to the Left Out of Battle (L.O.B.) camp near Bir Telata, after the last three tanks had been evacuated. It formed a composite squadron of Stuart tanks, which was instructed by US soldiers. The action on 21st November referred to in the report below left the regiment with only 12 to 20 tanks (instead of a normal state of close to 60 – only 1 tank had been lost until then), and the regimental commander Lt.Col. Byass DSO MC was killed. I will post further information on this engagement another day. OPERATIONAL REPORT, 7th QUEEN’S OWN HUSSARS DECEMBER, 1941. Reference the attached report of Operations carried out by this Regiment between November 18th, and November 29th, 1941, I append a few remarks in amplification of the report. (1) German methods of tank warfare. In the initial stages the enemy appeared to move his tank force in a concentrated mass. The column which attacked 7th Hussars on November 21st was a densely packed tank force numbering some 150 tanks. (N.B. These were actually counted approximately and this figure does not include tanks out of sight.) A/Tank and/or field guns appeared to be up with the tanks. Thus the full weight of attack of what may have been over half the total enemy tank strength descended on one British Regiment. Had close artillery support, i.e. 25 – pounder guns up in line with the 7th Hussars been available at the commencement of the engagement, very heavy destruction of enemy tanks must have resulted owing to their close formation. The enemy opened fire at long range and several tanks of the 7’h Hussars were destroyed before they could close to effective 2 – pounder range. The enemy appeared to fire three distinct types of ammunition. (a) An ordinary H.E. shell – either from guns mounted in tanks or from artillery up with the tanks. (b) An A/Tank armour-piercing shot, varying in destructive power, probably from different types of gun. (c) An incendiary shell which on explosion generated terrific heat and caused our tanks to catch fire, even though the shell hit the front of the turret. After 21st November, the German tank force appeared to split up into smaller columns which on the following days engaged unprotected M.T. Echelons and was a source of danger to our communications and higher headquarters. (2) A separate report has been rendered regarding certain technical difficulties experienced with the A 15 Cruiser tanks. (a) The importance of keeping sufficiently concentrated to maintain numerical superiority in the initial engagement against the enemy’s main force. (b) The necessity for early information regarding the enemy’s movements – in particular those of his main force. Information on November 21 S` arrived too late for 7th Armoured Brigade to concentrate. (c) Unless and until we have a tank gun which can equal that of the most modern German tanks opposed to us, 25 – pounder support under direct control of Regimental Commanders is essential. At 2,000 yards over open sights the 25 – pounder is a good A/Tank weapon, (vide subsequent action of the 4th Indian Division, R.A., which destroyed some 17 enemy tanks for the loss of only four guns). Desultory shelling at long range by 25 – pounders against enemy A.F.V.s is of little or no value. (d) Tanks of a Regiment should be all of the same type. 7th Hussars went into action with a mixture of A 15, A 13, and A 10 Cruiser tanks. Even the A 15 tanks were of different makes and certain gun spares were non-interchangeable. (e) A Echelons should be reduced to the minimum required for immediate replenishment, medical services and repairs to tanks. A Echelons are very vulnerable and, being close up behind the A.F.V.s are liable to be cut off by enemy columns. A small A Echelon can escape more easily than a large one. (f) All B vehicles not with the A Echelons should be with Brigade B Echelons. Intermediate Echelons are not practicable and merely constitute further vulnerable bodies of M.T. liable to become cut off and lost. (g) In open desert warfare, B Echelons will frequently, once the main tank forces have joined in battle, not be able to replenish units at night. Indication of leaguer location by firing verey lights is dangerous. (Signed) Major Commanding 7th Queen’s Own Hussars.